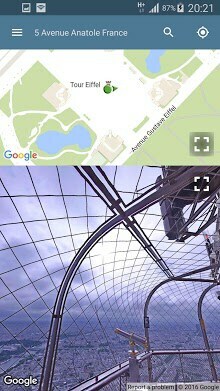 On the first launch the Street view panorama app shows you a rondom street view of a place on earth. 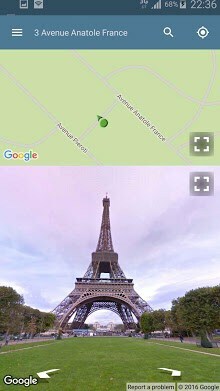 If you want to see the streetview of a place you choose, click on the search icon which is on the top right of the app then just type white box where you want to go and autocomplete feature will handle the rest for you. The app will take you to the street view of the location you choose on the map. You can navigate around the street views by manipulating both map and street panorama. Tap a street or a place on the map and the corresponding street panorama will appear under the map part of the app. If you move the location indicator on map the street panorama will change automatically, or move in the street panorama the location indicator on the map will move automatically. The location indicator also shows your direction. You can view panoramas or map full screen in addition to divided screen.